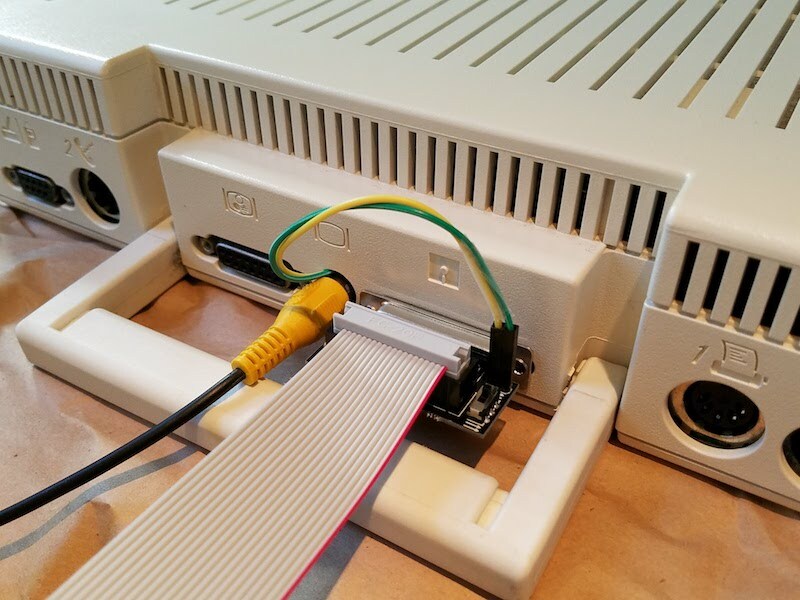 Version 2 of the Apple IIc Internal/External Drive Switcher is here, and is working nicely. It’s mostly the same as version 1, except for a few tweaks to the piece that goes inside the IIc case. Although the inside fit is still very tight, with this new version it’s a little more forgiving. I also updated the switch labels on the external portion of the drive switcher, with an icon showing parallel arrows for normal mode, and crossed arrows for drive swap mode. In my previous trials with the drive switcher, I threaded two wires through a gap in the Apple IIc case around the 19-pin disk port. 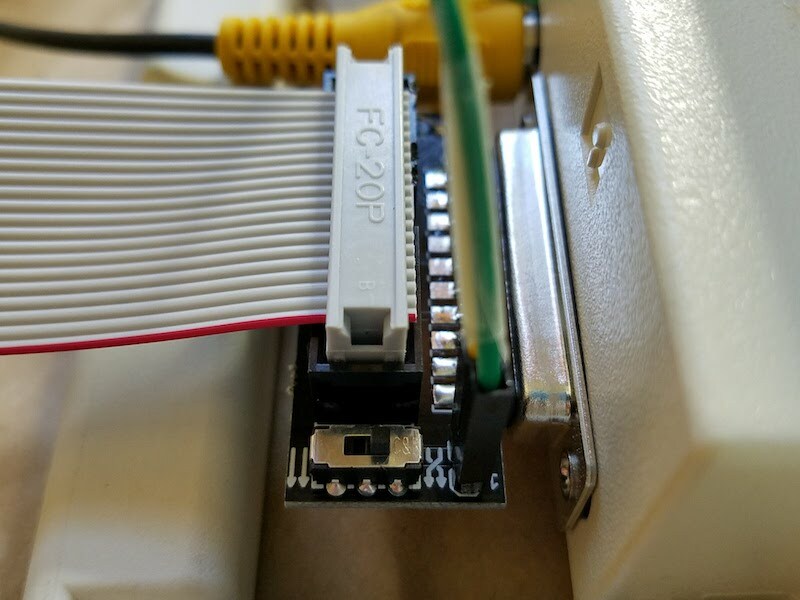 That works, but I’ve concluded it’s easier to thread the wires through the gap around the composite video connector instead, as shown in the photo below. There’s a little bit more wiggle room, and it avoids blocking the faceplate of the male DB-19 connector when the external portion of the drive switcher is plugged in. Threading the wires around the video connector doesn’t cause any blockage problems, and I had no difficulty plugging in the video cable. You could also thread the wires around the DB-15 monitor port, which most people aren’t using anyway. I think it’s ready! Now I just need to assemble a few of these and get them ready for sale. If you’re interested in helping to beta test the first few units, please let me know. Looks great! I would like to beta test it. Do you need to leave it connected when you remove it to use an external drive instead, or can you leave the couple of wires unplugged? OK, I’ll contact you soon to arrange for purchase of one of these first hand-built units. Price still TBD. The two pieces of the drive switcher are intended to be used together. If you remove the external piece and leave the two wires dangling, neither the external nor internal drive will work. If you don’t want to remove the internal piece, you could short the dangling wires together with a third jumper wire. Or leave the wires connected to the external piece, without plugging the external piece into the IIc. Thanks! I would just leave it connected to the external piece. I probably wouldn’t need to use the external drive much, but definitely would want the option occasionally since I have the external drive. Which position would the switch need to be in when disconnecting it and hooking up the external drive (X or ||)? If I hooked up the real external drive would the switch still swap the internal and external real drives? You’re talking about some non-standard usage: the drive switcher is a two-part device for the Floppy Emu, and things are going to get weird if you try using only half of it. But to answer your question, if the external piece is unplugged but still connected, then the normal mode switch position (|| parallel arrows) will leave the internal drive working normally, which then allows an external drive to work too. Swapping drives is not possible in that situation since the external piece isn’t plugged in. I’d also be interested in beta testing, I have an apple iic rom 0 upgrade 1985 board, with a mocking board 4c and a nonstandard hobbyist 4x rom installed inside. and by the end of this week I will have to funds to buy this board, as I already have a BMOW drive emulator. OK, I’ve contacted everyone who was interested in trying the IIc switcher. If you haven’t received an email from me, check your spam folder or send me a note via the Contact page. Thanks Steve! Invoice has been paid. Avery, I am jealous of your Mockingboard 4c. How do you like it? How often do you use it? I love the thing when I have the time to play an apple ii game that supports it, it works well. The one problem with it is that you have to do ether a poke command to get it running or you have to drop into assembler and do a command. But after that it works like a dream. I think I have all the testers I need for now. Assuming they don’t find any problems, it should be available in the store soon. I would love to beta-test! Testing is over – you can find it in the BMOW store. Currently sold out, but more will be available in about two weeks.